These transmitters are designed to be mounted in the ear of large mammals such as bears, deer, bison or hippopotamus. 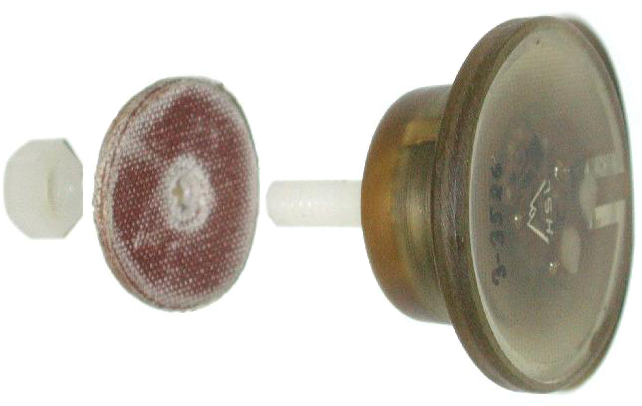 Attachment: The transmitter is placed in the cup of the ear. The 1/4″ x 20 threaded nylon stud is passed through a hole in the ear and secured with a fabric washer and nylon nut. Housing: The battery and transmitter are encapsulated in an inert waterproof epoxy. Antenna: A loop within the epoxy encapsulation. Mortality (suffix “M”): EI-2A only. The available delays are 4 or 12 hours. The 4 hour delay circuit indicates its activation by a double pulse. The 12 hour delay circuit indicates its activation by increasing the pulse rate from a nominal ~42 ppm to ~75 ppm. After the mortality mode has been triggered, any motion resets the transmitter to the normal pulse rate. This option adds ~0.5g to the finished weight of each transmitter.